Includes the Film, Streaming Media, Audiobook, and Music collections. Search the library catalog by keyword, title, subject, or any associated name. In the right column of the search results, limit by the format you are looking for. The "Netflix of Video Bible Studies" for use in church, classes, Sunday School and more. 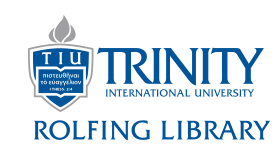 Trinity students and staff can create accounts by visiting https://www.rightnow.org/Account/Invite/TIU. Available to Deerfield and South Chicago campuses. Video collection of online streaming video for scholarly research, teaching, and learning. A digital archive of televised proceedings from the U.S. government since 1987. OverDrive has a collection of audiobooks for browsing and download. The Music collection includes classical and sacred music, with a small collection of music education curriculum resources. The Film collection at Rolfing primarily supports the academic disciplines at the university. It also has a significant collection of international films, classical films, and socially-focused documentaries. In addition, it also includes significant recent films, and a small juvenile film collection. For information on appropriate use of the film collection, check the tab for Showing Library Films. The audiobook collection is primarily fiction and general Christian non-fiction, with a small selection of more academic works.